"I love a doctor that takes time to answer all my questions and makes me feel that my health and well being is as important to her as it is to me!" "I will be forever grateful for Dr. Arroyo - she was very personable, easy to talk to, very attentive and thorough." "Highly recommend Dr. Arroyo. I had a long term problem that many other doctors had not been able to diagnose. Dr. Arroyo knew what it was right away." 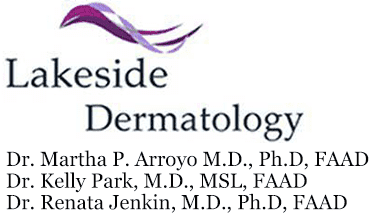 "My family and I always receive great care at Lakeside Dermatology. Dr. Arroyo is amazing and has a great bedside manner." "My family and I have been with Dr. Arroyo for years. It's a busy office but worth the wait." "I have to say she has the best staff I have seen in an office. They are truly are a team." "Dr. Arroyo is simply the best! Very smart, very kind, knows what you need and makes sure you get the best treatment." "Had to bring my 7 year old son in yesterday to Dr Arroyo. She was so nice to my son and took such good care of us." "We love Lakeside Dermatology, the entire staff is helpful, the doctors are informative and genuine, and the office is always clean and inviting."